The first team I got from Iron Golems is still overall my favorite Dwarf team ever. Pedro Ramos really knocked the design and sculpts out of the park with that team. Unfortunately, Pedro was not available for the Pro Box teams, so the Human and Dark Elf teams included with the Pro Box ended up being designed by Sergi Torrás and David Fernández in a 3D modeling style as opposed to Pedro Ramos classic hand sculpts. I followed the campaign with a lot of interest, but honestly, since it took so long for the end product to show up, I could not even remember what all I pledged for in this campaign. Doing this unboxing was, in some ways, a bit of a surprise for me. Time to start pulling things out! 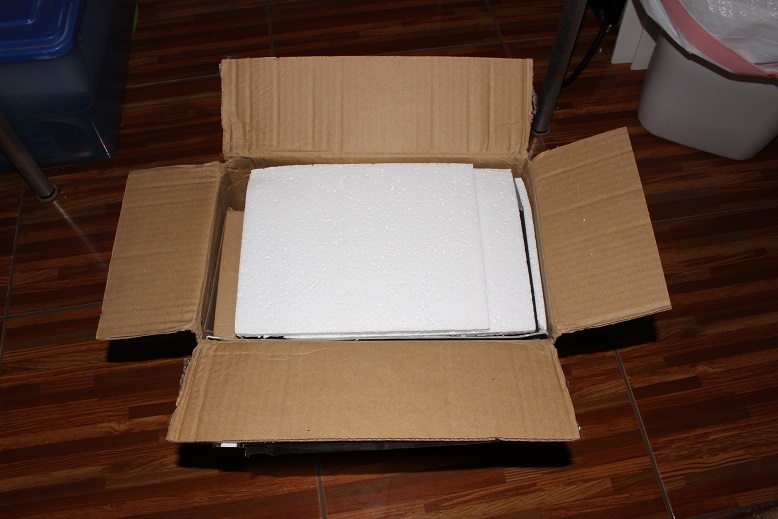 The shipping box was a little beat up after the journey from Spain, but I was glad to see a fair amount of foam packing inside. 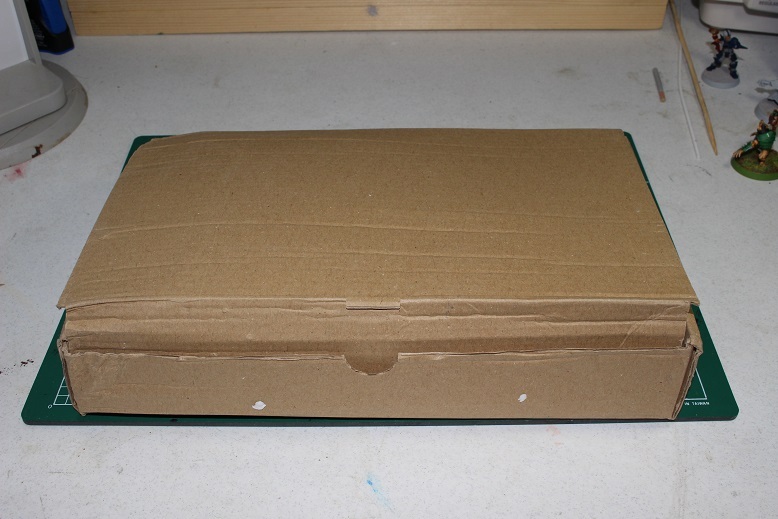 I managed to get all of the packing material removed. 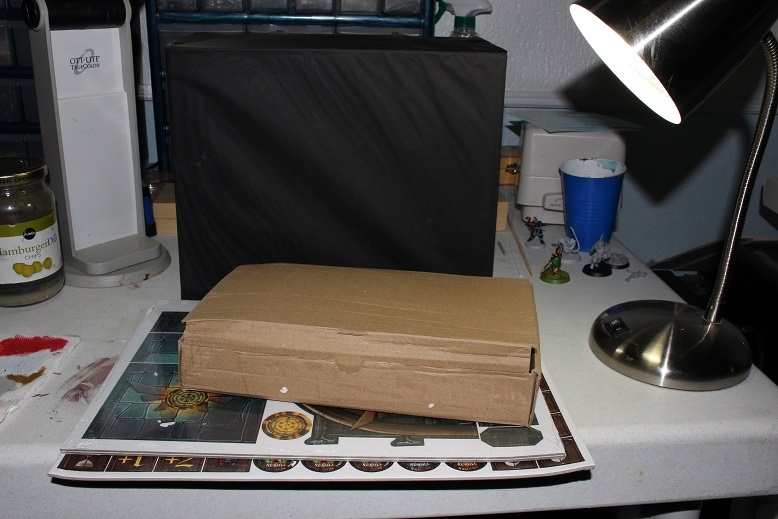 The box on the left is all the minis, tokens, and other extras, while the box in the right is the Pro Box itself. This is everything included in the Pro Box in one big pile. 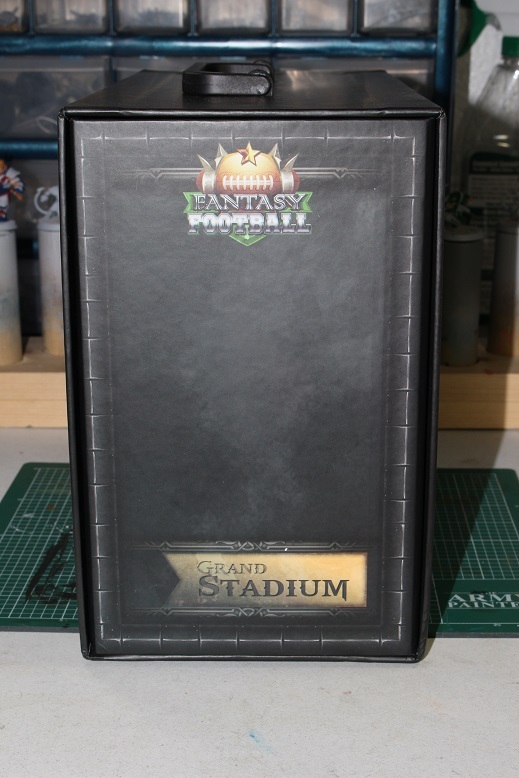 The Pro Box, the minis, tokens, counters, a cardboard dice tower designed to match the pitch in the box… lots of good stuff here. OK, I have to admit, that is a fairly nice logo design there. Slight ding on the left here from shipping, but it is not too bad. A good start so far. 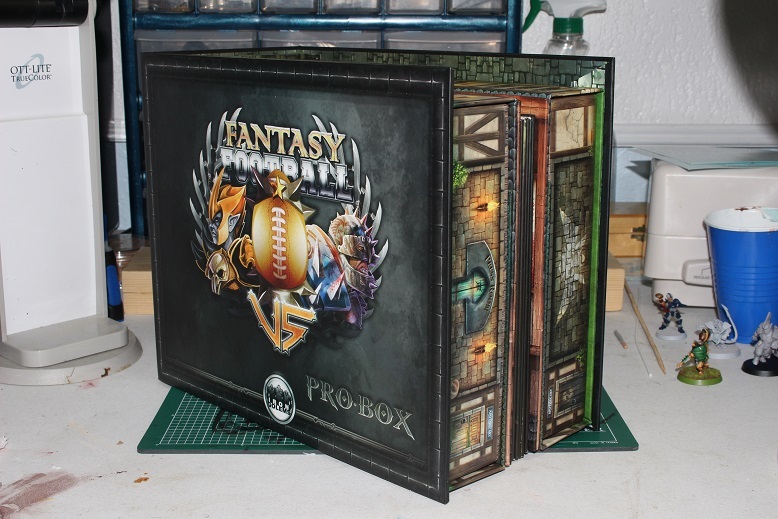 A nice looking, compact package with a handle on top for easy carrying to your FLGS for league night. 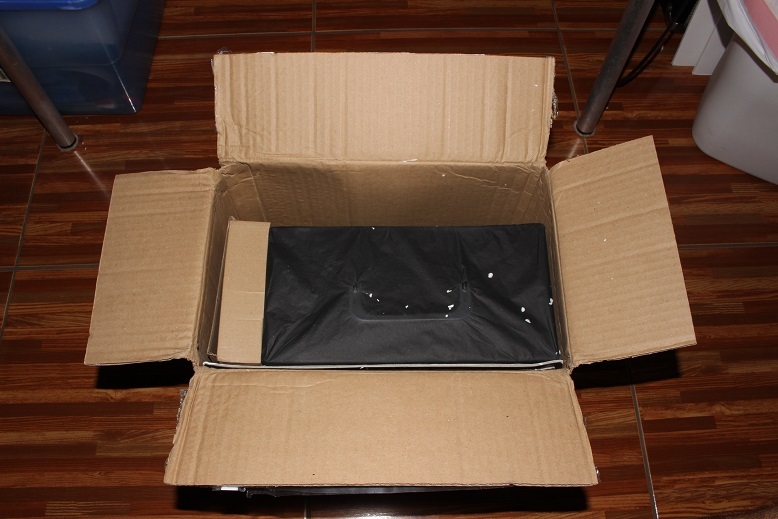 This is what is on the inside of the Box. 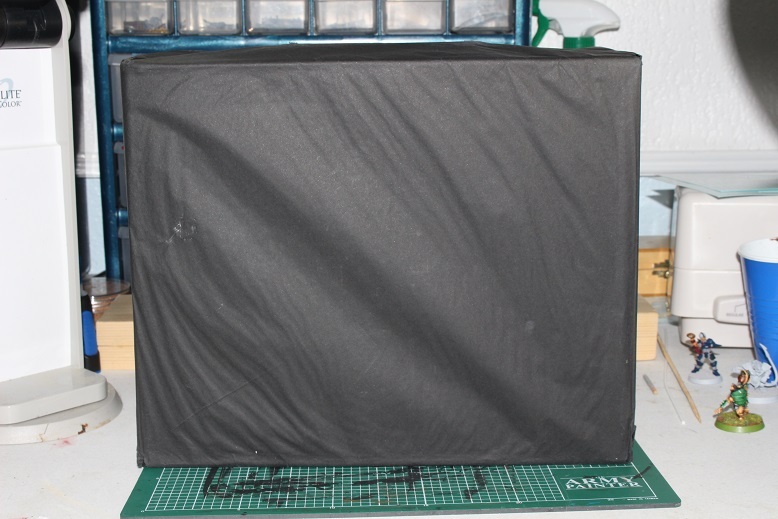 This piece folds out to reveal a pair of scoreboards that double as mini storage. 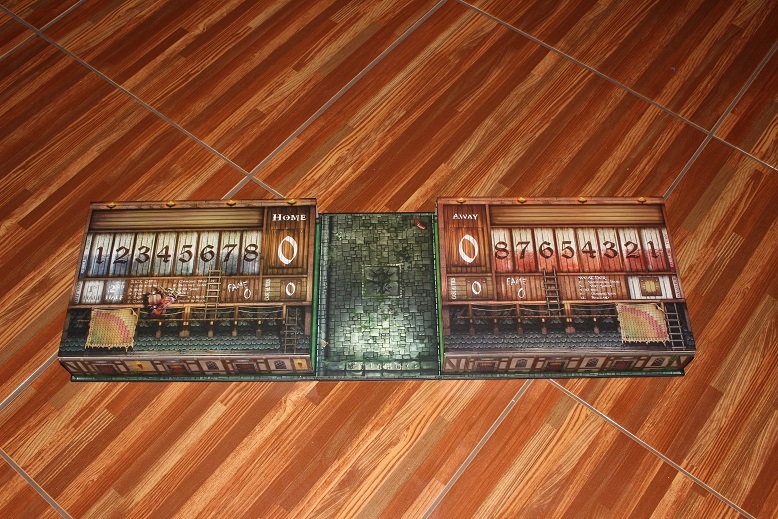 In between the two scoreboards halves, you can see the folded game board. Here is the scoreboard sections unfolded. The scoreboards are magnetic as are the counters that attach to it for keeping track of turns and score (more on those counters later). The dugouts open up to reveal the integrated mini storage. 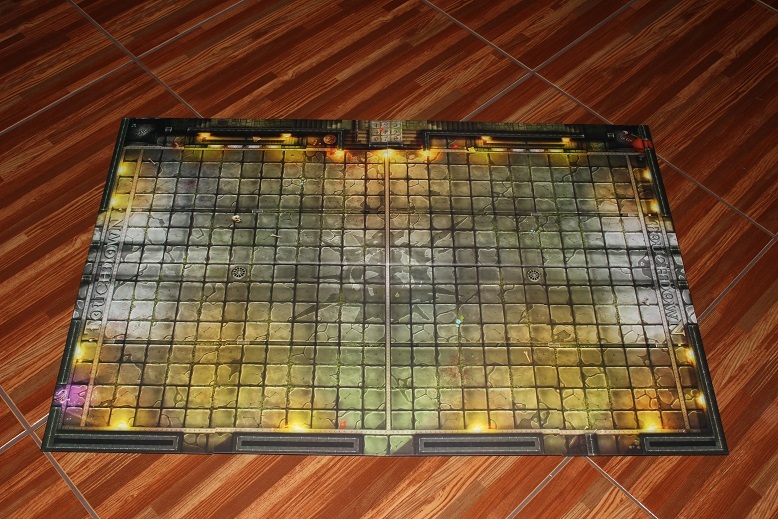 Time to take a look at the game board! 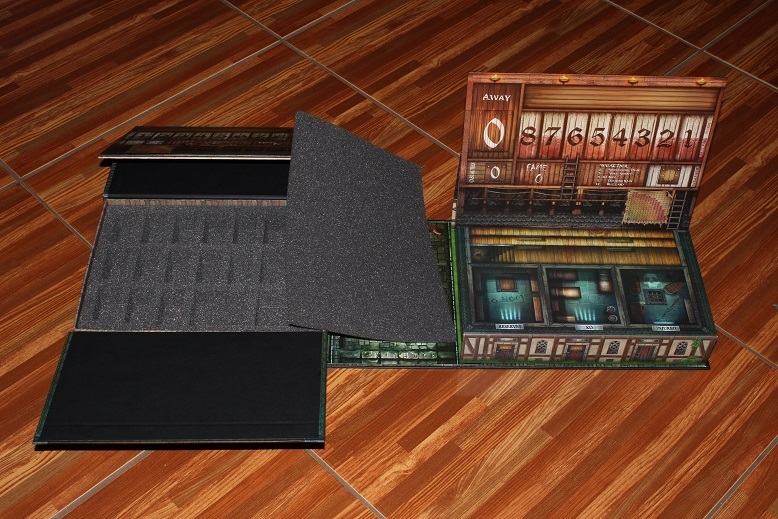 The board uses the old 3rd edition sized squares at 29mm, so it folds up to a fairly compact size. 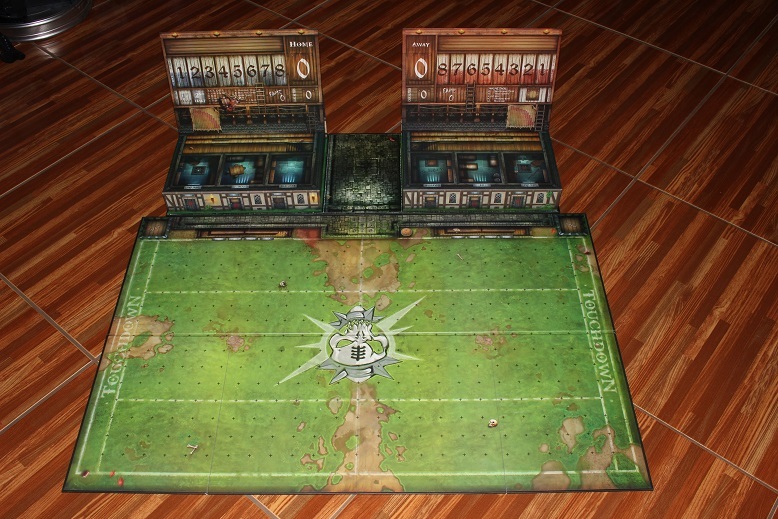 Here is the standard grass side of the board. Again, a nice design and the squares are easy to see. The pitch and the scoreboards ready for action! It looks pretty big, but it really does not take up any more space than the old 3rd edition pitch and dugouts. 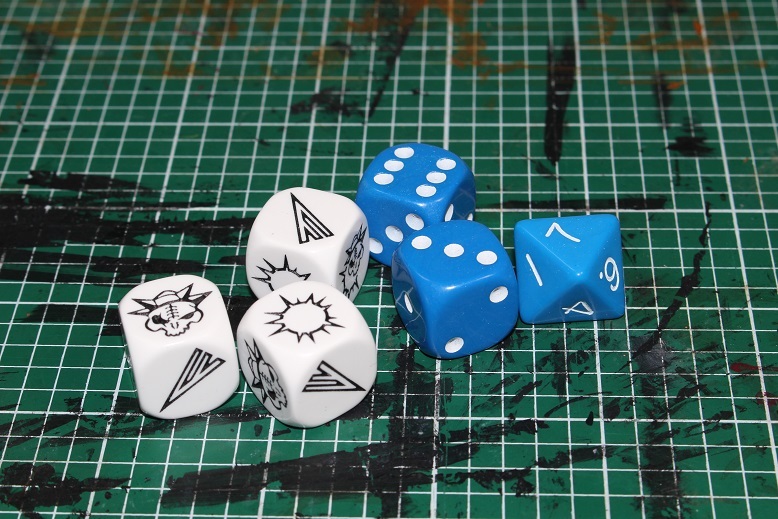 Some pieces from the dice tower. More pieces for the tower. 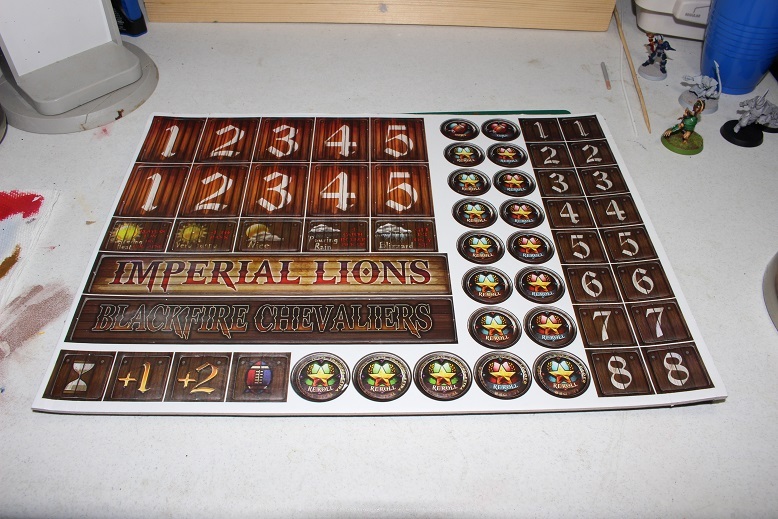 Included is a nice collection of counters for the scoreboards. As mentioned earlier, these are all magnetic to enable them to stick to the scoreboard. They are basically counters printed on refrigerator magnet material. 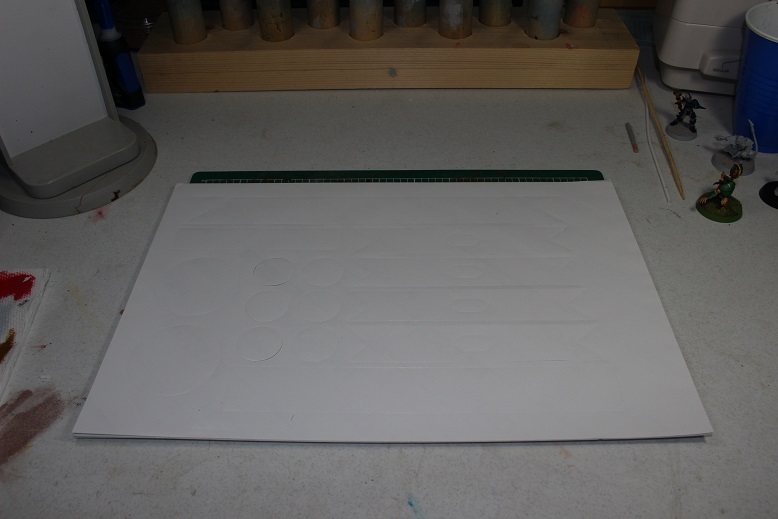 I admit that this pic is really hard to make out, but the idea is that you can print off custom banners and counters with this sheet. 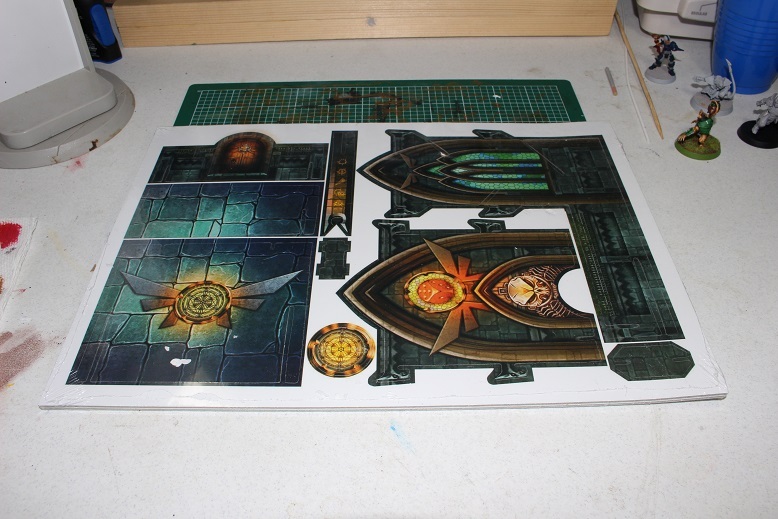 To be honest, the banner and token shapes are pre-cut, and the cut runs a little deep on the sheet. 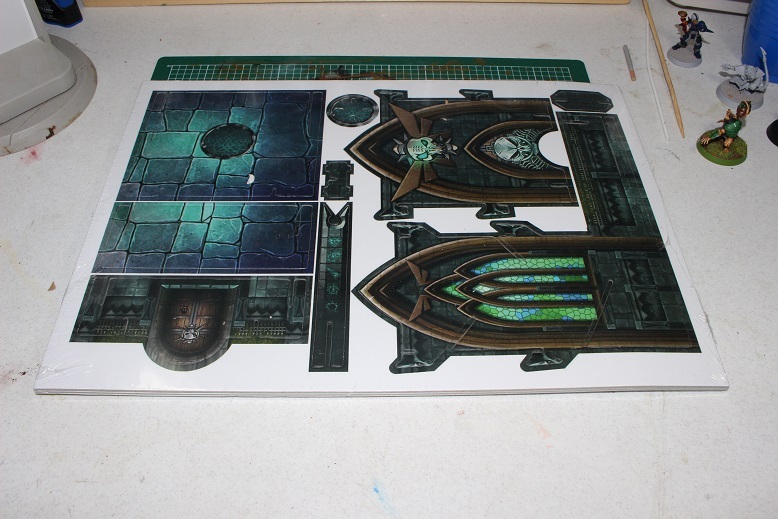 I would be surprised if all the pieces actually survived a trip through a printer. I suspect that more than a couple of them will disappear themselves somewhere along the paper path. Time for box number two! 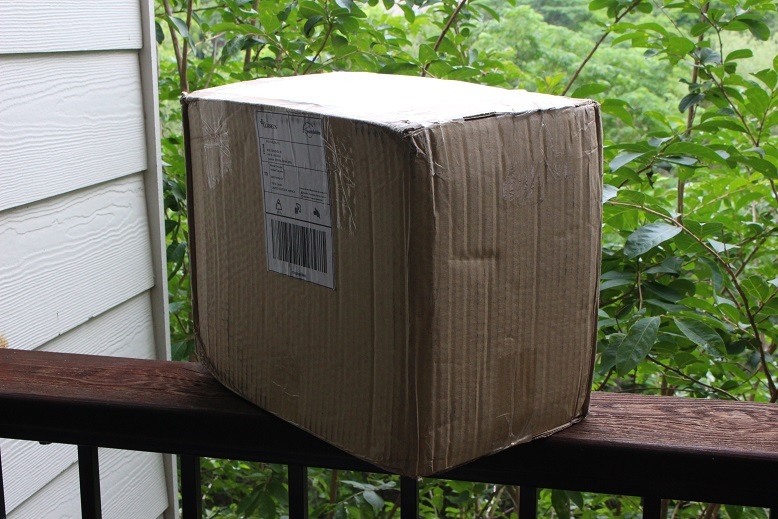 What magical mysteries could be contained inside? 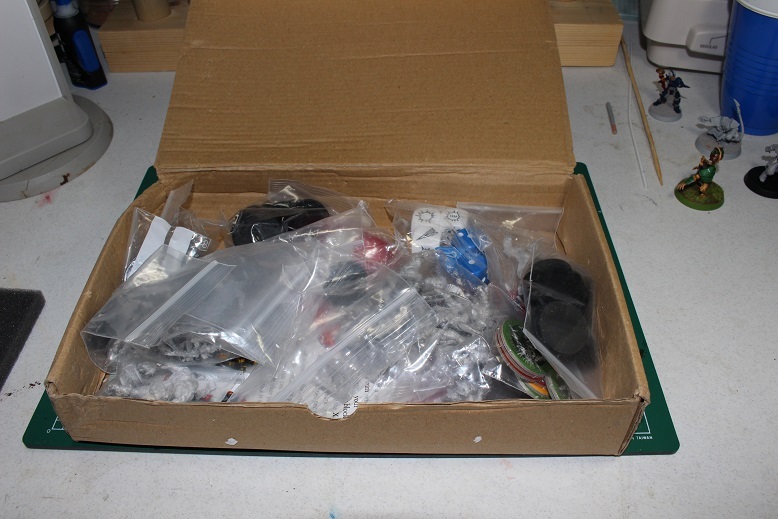 Wow… that is a lot of stuff crammed into that small box. 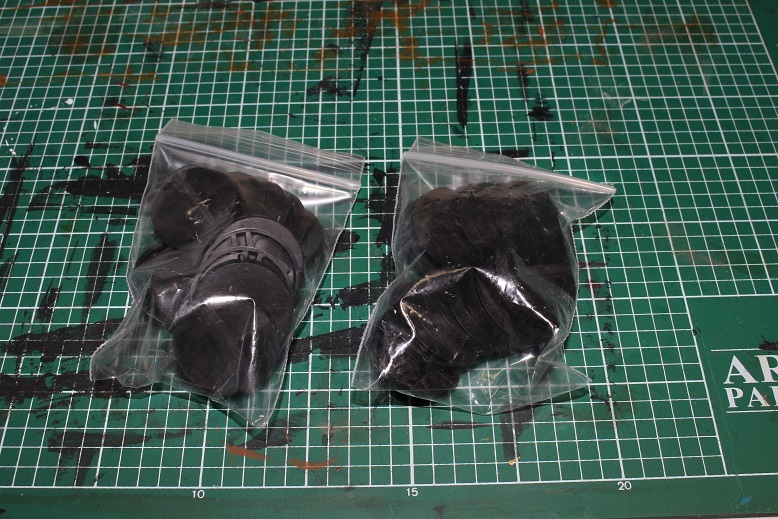 Included are two packs of 25mm round bases. I am not exactly sure who manufactures these bases, but I have seen a number of the independent mini companies use them. I have to be honest, I am not really a fan of these bases for two reasons. While the Games Workshop bases are slightly textured on top, these are completely smooth. I have had some problems in the past with basing gravel simply not sticking to these bases because the glue does not have anything to grab on to. As a result, the basing sand can simply lift right off of the base. That is really frustrating when you are putting the finishing touches on a mini and the sand just starts flaking of in large sheets. 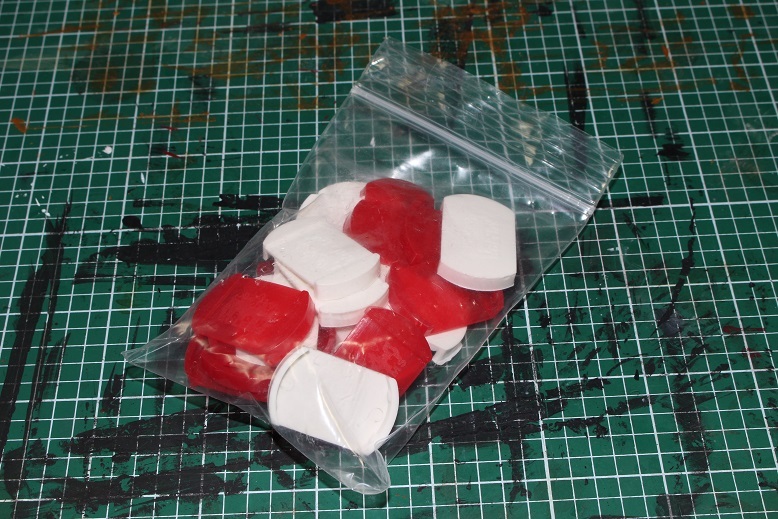 These function as both standard bases, and slotted bases, which is OK. you just take a hobby knife and cut out the slot for your base tabs. The part I do not like is that while traditionally, the slot in slotted bases are slightly off center, these slots are dead center on the bases. 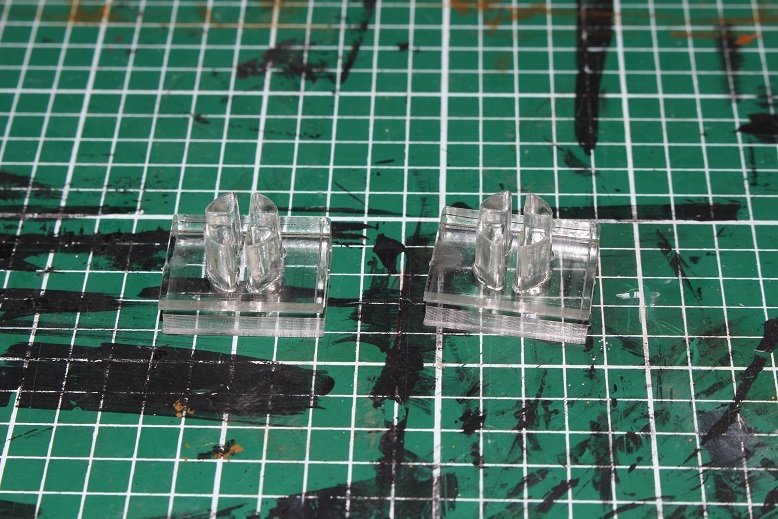 That is a small gripe, but I simply prefer off center slots on my bases. 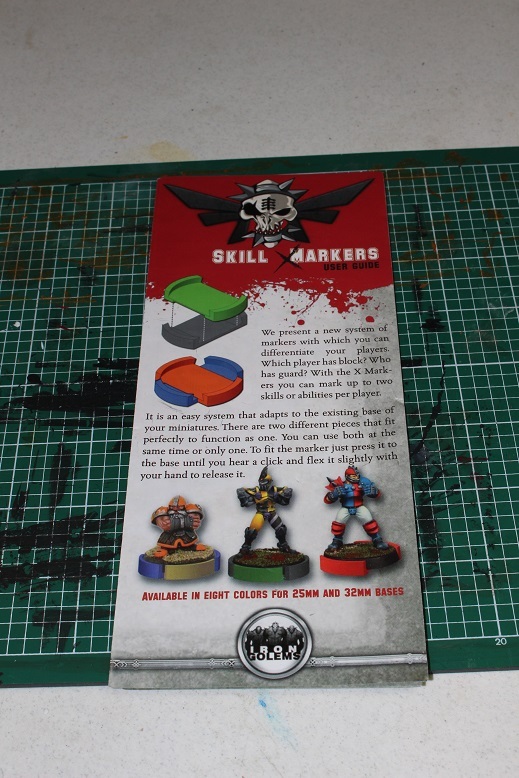 This is a small fold out pamphlet showing how to use the Iron Golems Skill Markers system, complete with suggestions on what colors to use for common skills and combos. I did not pledge for the full set of markers, but I did get a few as a standard perk in my pledge. 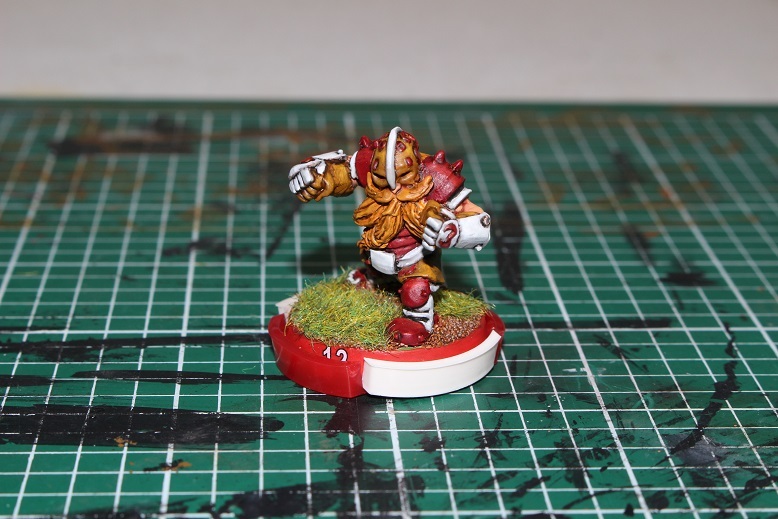 This is one of the Blitzers from the fantastic Iron Golems Dwarf team that I got last year. I am going to use him to show the Skill Markers. Here he is with no skills. Here is the Blitzer with one skill. Honestly, I do not really see myself using these. Clearly marking skills is important so that both you and your opponent can remember which players have which skills, but I do not think this is the solution for me. Small, colored rubber bands work well enough and are cheaper. Plus, you can wrap as many rubber bands on the mini as you need to represent all skills while these markers are limited to two per mini. There is also a nice set of Stunned, Prone, Bone Head/Really Stupid, Rooted tokens. 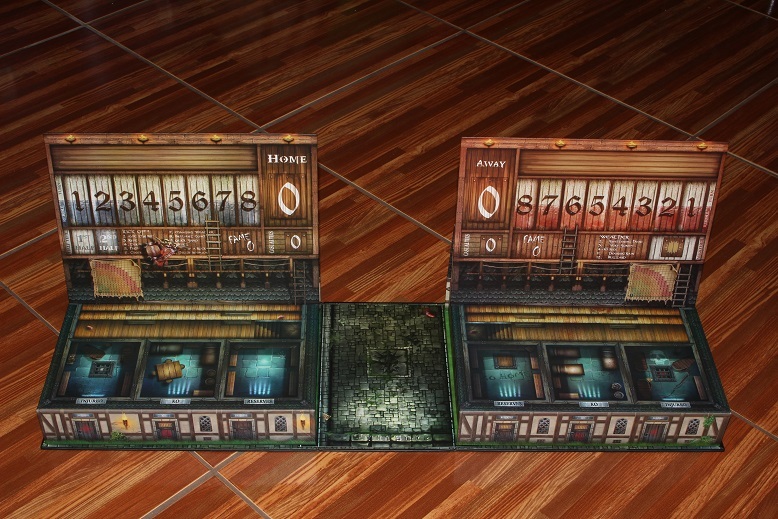 These tokens are all double-sided so you end up with four of each token. They have some nice 2nd edition inspired art work on them. 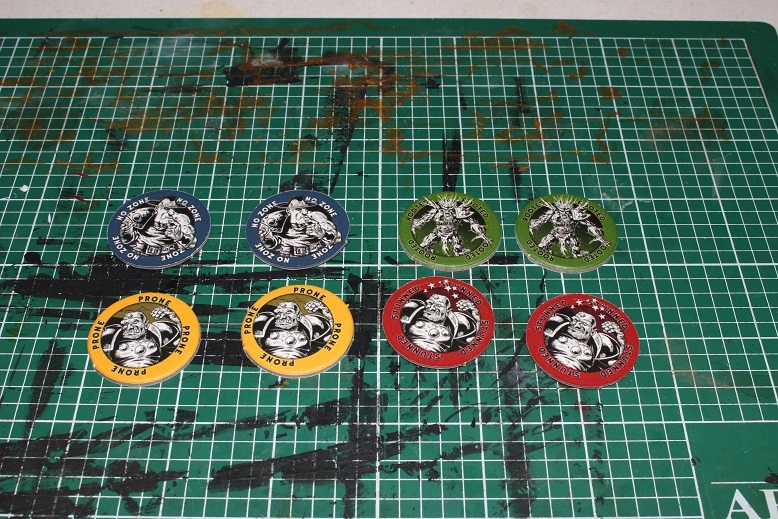 It has been pointed out that the artwork on these tokens was drawn by Pete Knifton who was the artist who worked on the actual 2nd edition Blood Bowl art. 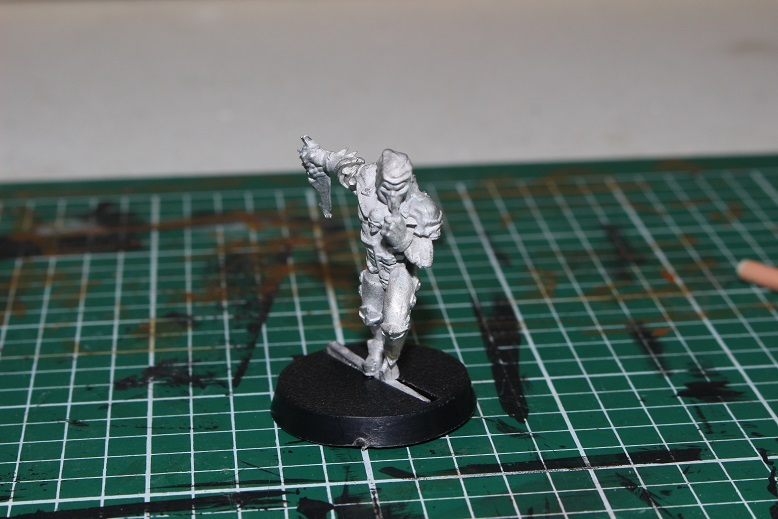 I do not actually remember this being any part of the Kickstater campaign, but a Sacred Comissioner Rozel mini from the Dwarf team campaign was included in the box. Since I backed the Dwarf team campaign, I already have one of these minis, so this second one might go into the “for trade” bin. 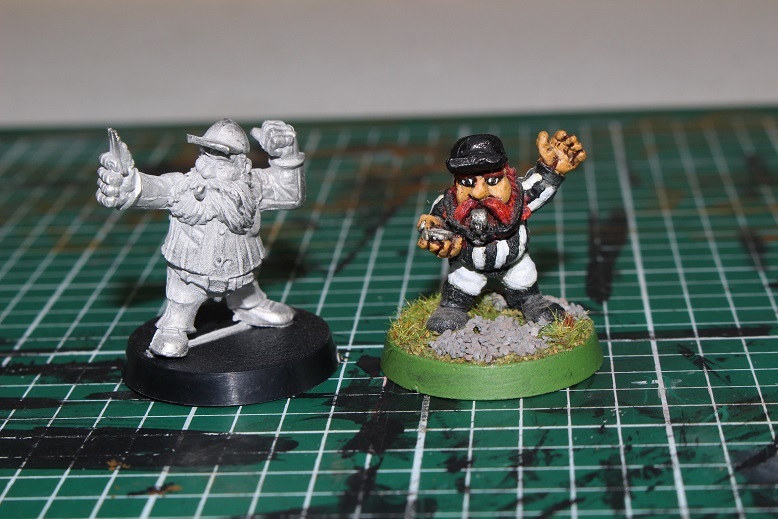 Here is a nice little extra to add to my Iron Golems Dwarf team. 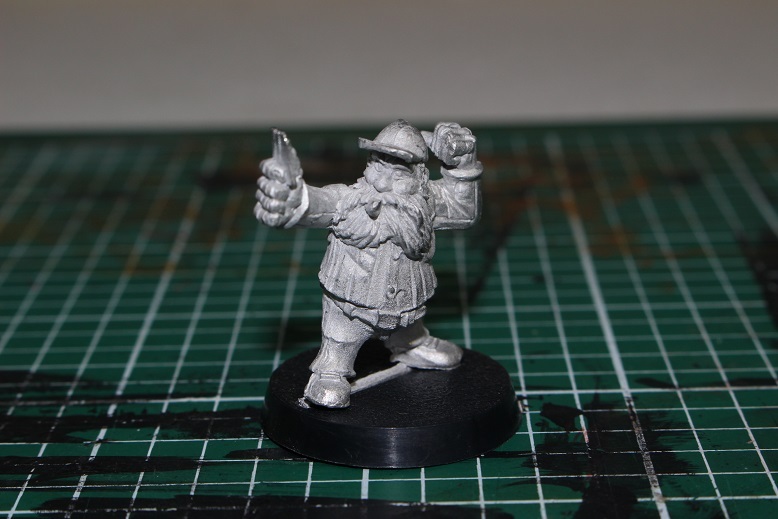 A dwarf ref sculpted by Pedro Ramos. 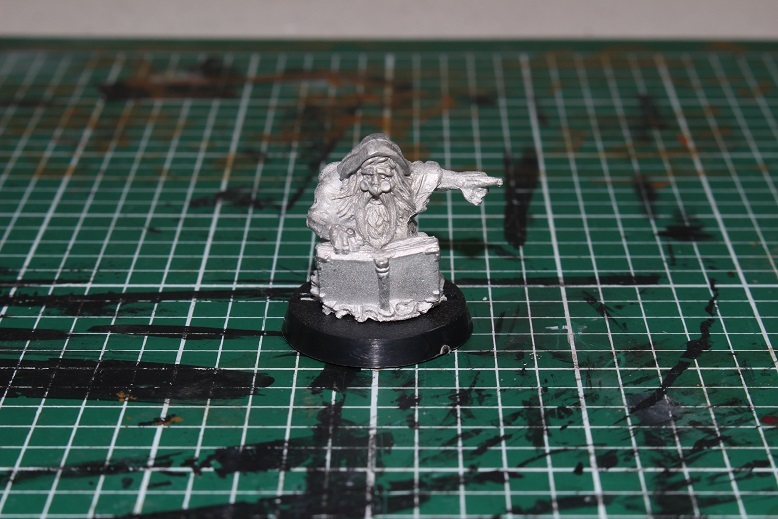 I do have an older Games Workshop Dwarf ref as well, but now that mini can stay exclusively with my 3rd edition Games Workshop Dwarf team, and this one can go with my Iron Golems team. 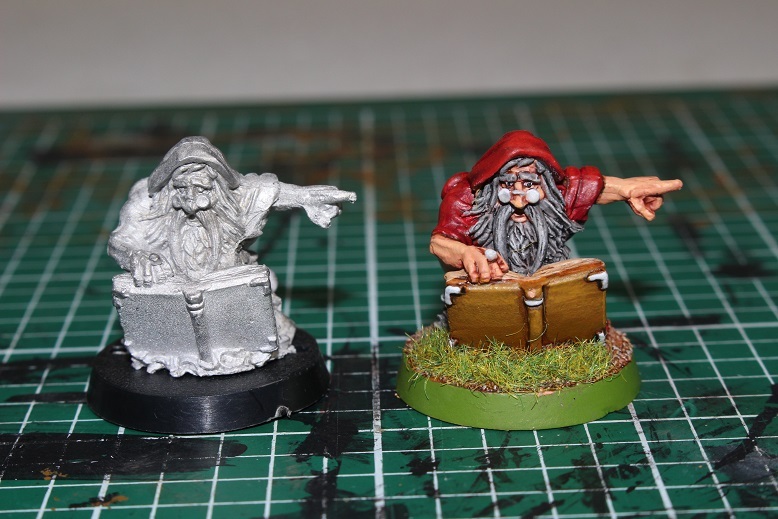 Here is the Iron Golems Dwarf ref next to the Games Workshop version. I painted this mini about fifteen years ago… Do not judge me. This is the Iron Golems version of the Mighty Zug. 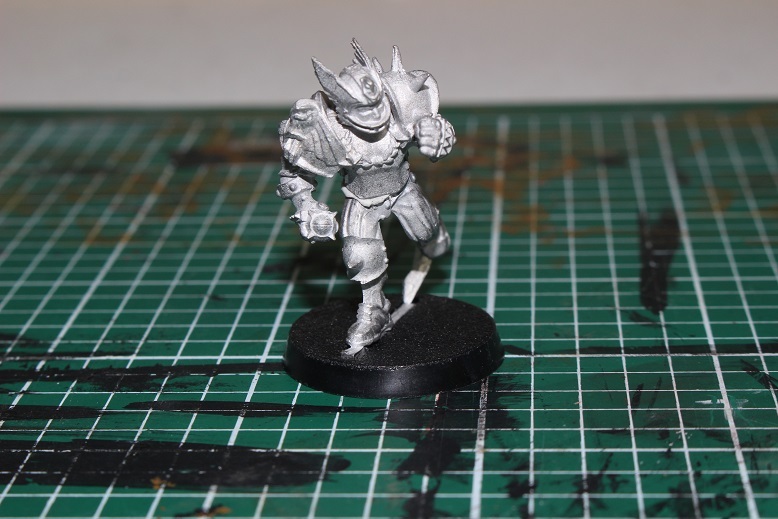 Honestly, when compared to the most recent release from Games Workshop, this Zug is not all that Mighty. It is not a bad mini, just a little on the bland side when put next to a number of newer releases. Iron Golems also gave us their interpretation of Morg ‘N’ Thorg. The mini is obviously 2nd edition inspired, but I was a little surprised to find that it did not really feel much like an Ogre when looking at it. 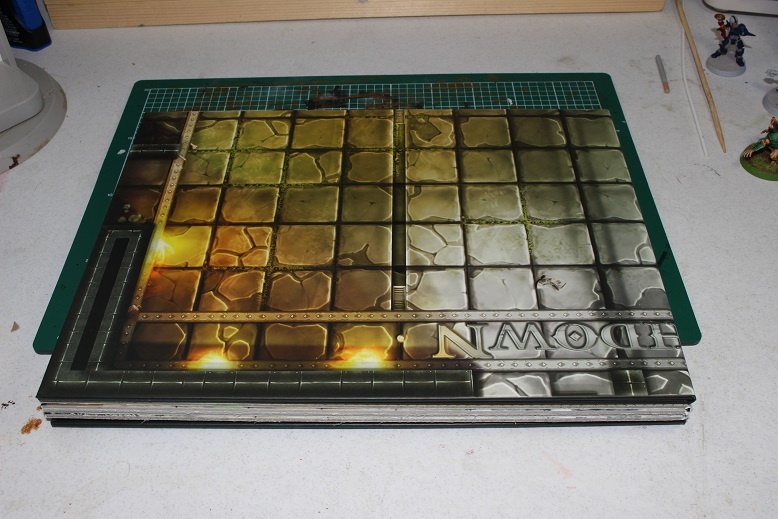 As an example, here is a size comparison shot with a 3rd edition Morg and the newest Games Workshop Morg. The Iron Golems Morg is down right puny next to the newest Morg, but even the 3rd edition Morg makes it seem a little on the skinny side. Maybe Morg has been on the Atkins diet? 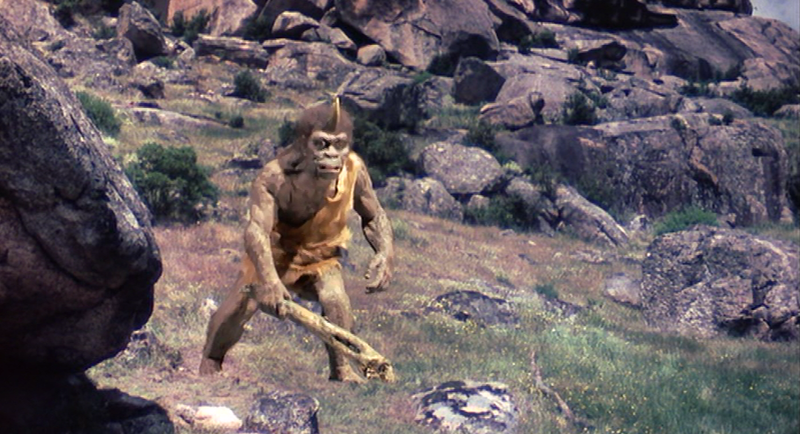 Honestly, more than anything, this Iron Golems Morg reminds me of the character “Trog” (short for Troglodyte) in the 1977 classic film, Sinbad and the Eye of the Tiger. 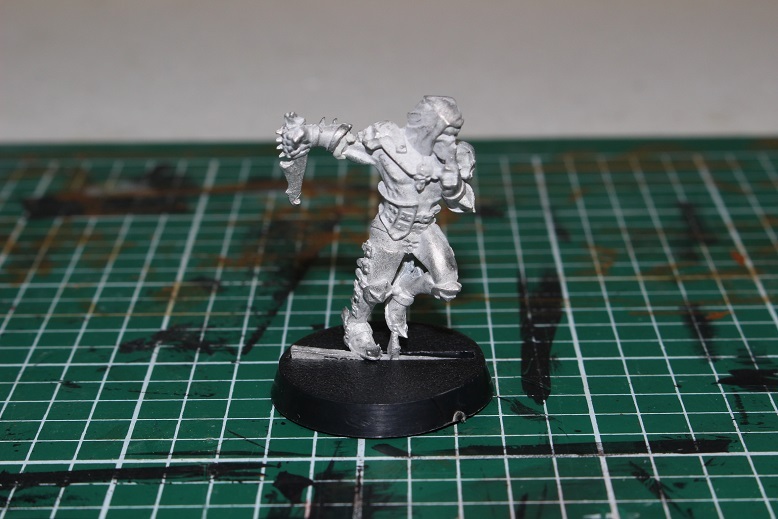 As an add-on, I opted for their Griff Oberwald mini. In my opinion, it beats the 3rd edition “Chickenhead” Griff, or the 5th edition “Tripping” Griff. I would say that it is fairly on par with the “Final Edition” Griff that is SO hard to find. Another view of the Iron Golems Griff. 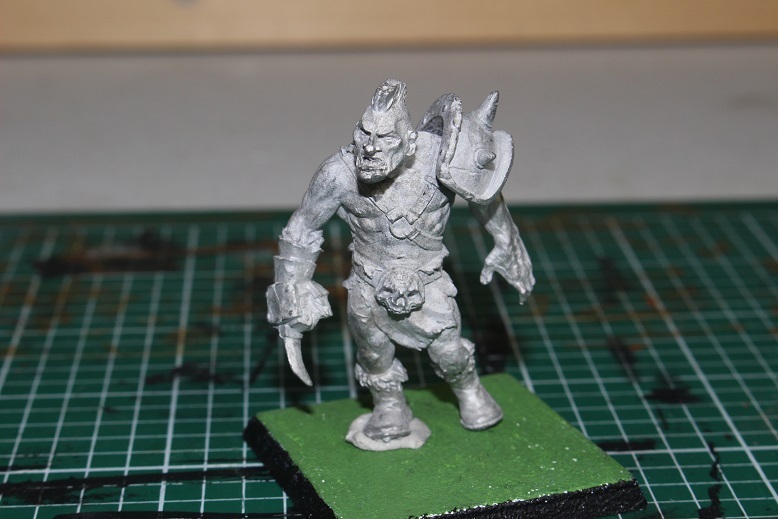 It is a fairly decent Griff, but much like their Zug mini, the newest Games Workshop Griff is honestly MUCH better. 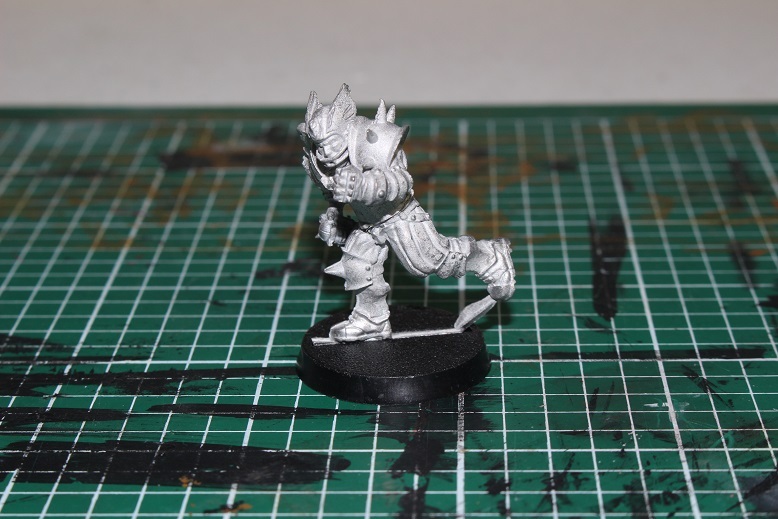 Along with Griff, the “Star Player” add-on also included a Horkon Heartripper mini. 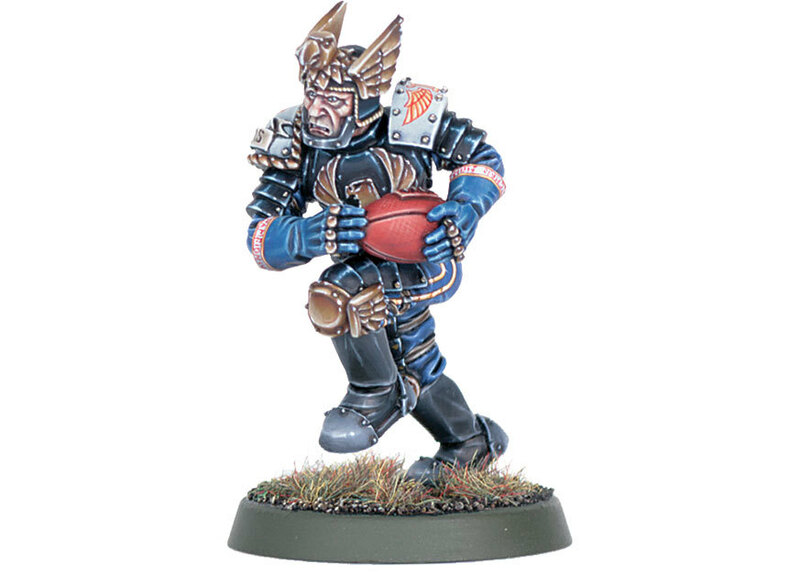 I think this may be the best mini in the box. 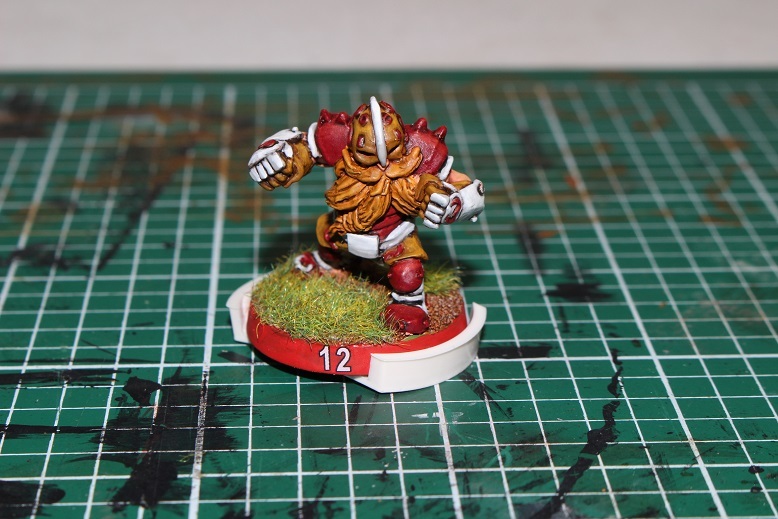 It is MUCH better than the old 3rd edition Horkon and has a good amount of detail to show off his Star Player status. Here is the rest of the Dark Elf team. I am not going to go into detail about each individual mini because there are just too many to really highlight in a single post. If you guys want more pics and detail about the individual minis, let me know and I might do separate posts for each team. The rest of the Human team. Again, if you want more detail on the teams, let me know and I can do separate posts. One thing I will say about these minis, especially the Human team is that looking at them in person, they seem a bit… plain. I mean, I get that they are supposed to be 2nd edition inspired, and that “classic” minis did not go crazy with details the way that modern minis tend to, but some of these minis feel like they have almost no details at all. Considering how nice and detailed their Dwarf team was while still maintaining a 2nd edition flair, it just seems strange to have some of these minis seem so bland and generic. The Dark Elf team seems to have a really nice amount of detailing without over doing it, but it almost feels like the Human team was kind of phoned in. At least, that is my impression of them. 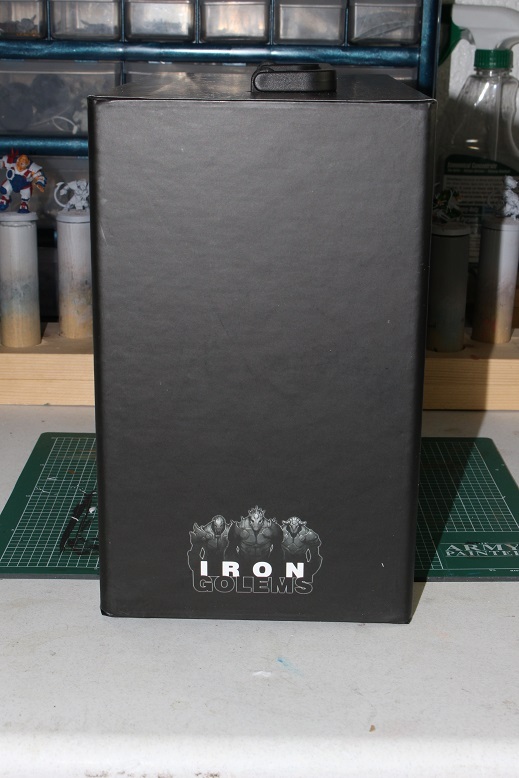 Despite a few issues, the Iron Golems Pro Box is a pretty nice set. 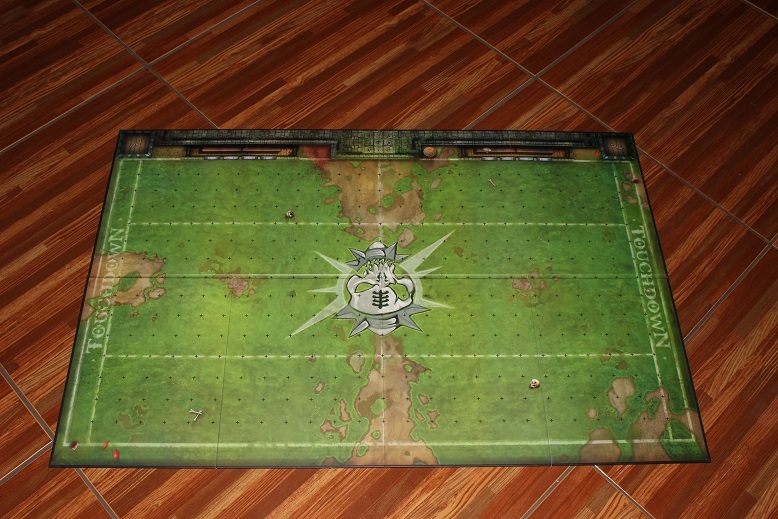 I got caught up in the excitement of the crowd funding campaign and spent way too much money on it, but I also got a lot of cool Blood Bowl related paraphernalia. 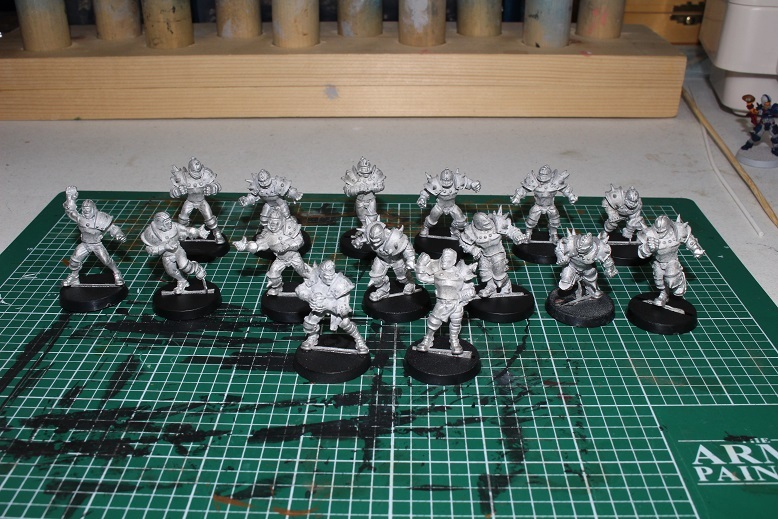 Here is my current dilemma, though… When I pledged for this set, Games Workshop had not yet announced that Blood Bowl was going to be re-released. Since that release, I have (of course) gone more than a little overboard buying all the new Games Workshop pieces as soon as they hit the shelves. 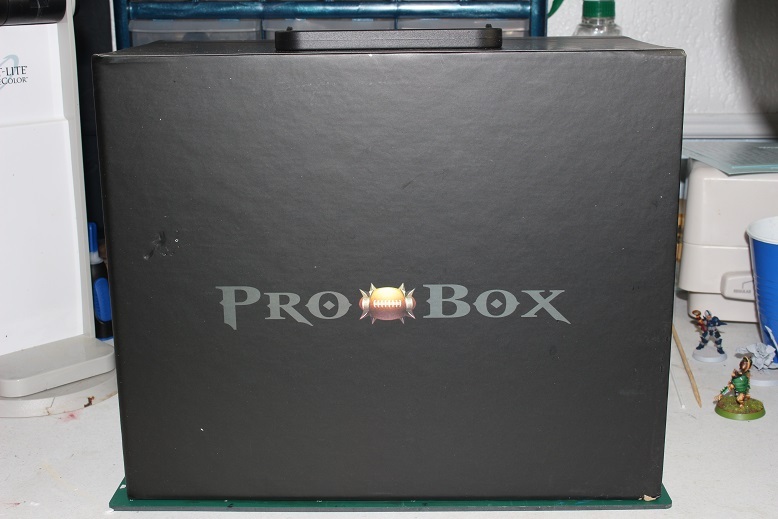 As such, I have started to ask myself a couple of simple questions… Do I really need this Pro Box? It is really cool and includes some good stuff, but do I NEED another pitch (I currently have seven others)? Do I need another Human team (I currently have three others)? Do I NEED another Dark Elf team (I currently have two others)? Do I NEED another set of Block dice (I have too many others to even count)? In the end, I am on the fence about the Pro Box. 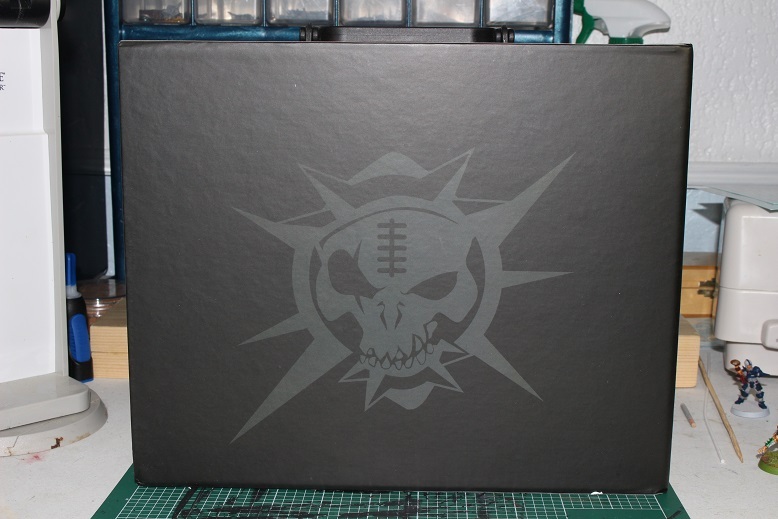 I may end up selling it off to make more room on the shelf, and in my budget for more Games Workshop Blood Bowl (or Shadow War: Armageddon) releases, though it is highly unlikely that I will even come close to getting my money back out of it. Right now I am leaning towards selling it, but I will give it a week or so and see how I feel then. 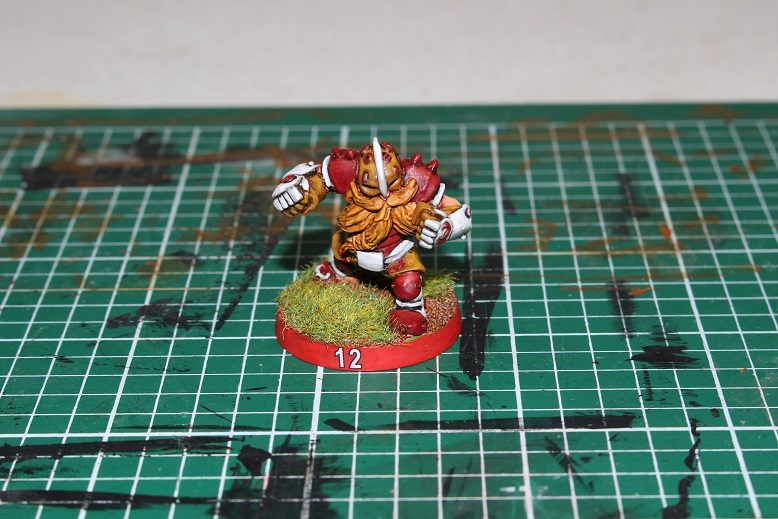 This entry was posted in Blood Bowl, Gaming and tagged Blood Bowl, gaming, Griff Oberwald, Iron Golems, Mighty Zug, Miniatures, MORG 'N' THORG, Pro Box, table-top games, tabletop wargames, wargames, Wargaming by Mike C. Bookmark the permalink. Thanks! Honestly, I do not really know that the scale of the new minis has anything to do with the third party market. 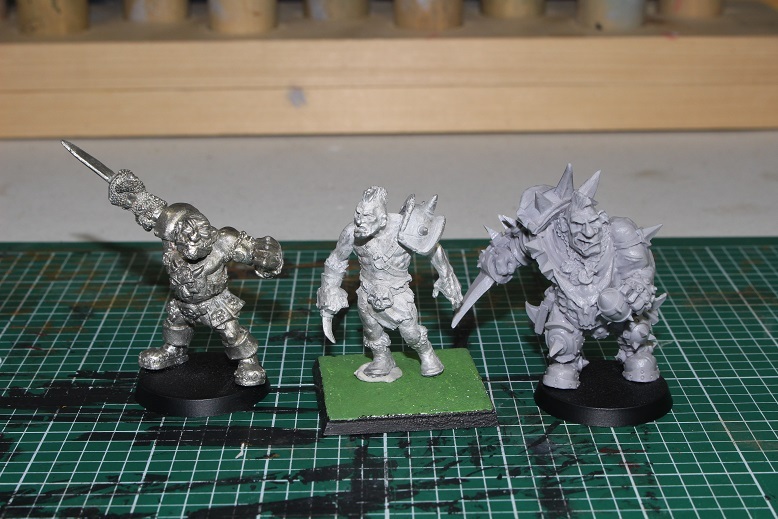 The newer minis are completely in scale with the rest of GW’s current line, and a fair number of the third party options were already being made in 32mm scale. 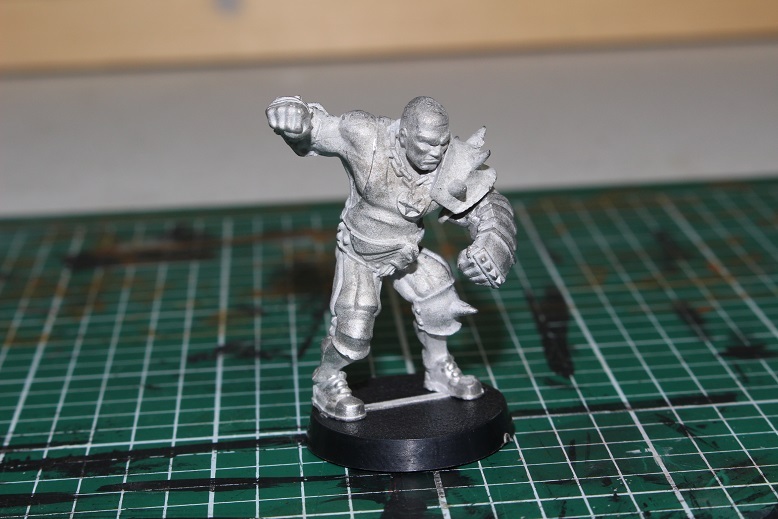 I think it has more to do with being able to pack a lot more detail on to a 32mm mini than a 28mm mini. 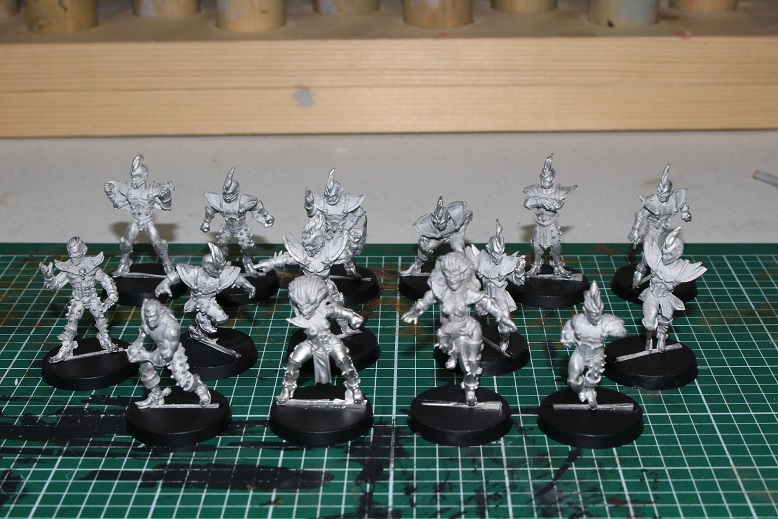 Also, I did order the Bright Crusaders kit from FW, but only to add a little variety to my existing Human team. I do not plan on making a full on “Bright Crusaders” team with them. Good point, I also feel like the bigger pitch helps with the crowding issues that sometimes happen with a lot of big guys on the field. Nice write-up overall. I like the pop up stadiums and score keeper. I’ve been toying with the idea of making a custom one at some point. I also like the Dwarf referee and Horkon. I’m tempted by their Dark Elf team, but will depend what I think of an Elf team that I have coming.